There are few subjects which stimulate as much controversy as illegal recreational drugs, however, with the illicit drug industry turning over hundreds of billions per year in the US alone, this is certainly not an issue to be dismissed or avoided – it’s a significant part of modern life that we must understand as comprehensively as possible, to avoid acting or speaking in ignorance. The recreational drug user is a person who you might never suspect takes drugs. They are shopkeepers, bankers, civil servants, policemen, lawyers, doctors, electricians, hairdressers – in fact, they’re everywhere, in all walks of life. They can often hold down their jobs, function in their communities, and pay their taxes as well as the next person but when the weekend comes, they step into a different energy level via their drug of choice. Why do drugs appeal to so many people? Whilst I observe that society is generally well informed on the dangers of taking drugs, I find the background reasons surrounding why people choose to take drugs are rarely discussed openly – and the Why, I believe, is the most important factor we can focus on. Telling a person not to take drugs because “They’re bad for your body” will often do nothing to change the mindset of the recreational user, for you’re telling them nothing new. To address the issue of drugs, we must venture into the human psyche and consider the situation from a spiritual perspective – as all recreational drugs are taken for the mind, not for the body. Whilst the term of being “out of your mind” on drugs (or alcohol) is commonly used to describe being high (or drunk), I think this phrase gives us a crucial insight into the experience that users are searching for and is a good place for us to begin our contemplation – humans often get fed up with being caught up in their mind, which never stops whirring and they seek a release. 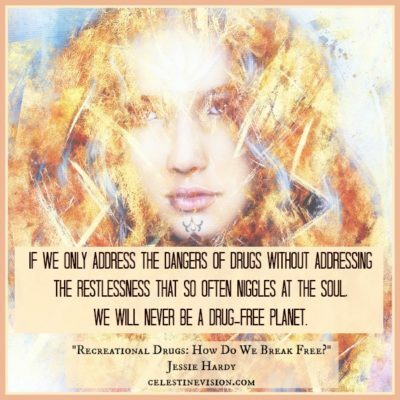 The recreational user may say they take drugs simply to have fun or to relax – perhaps they’ve worked hard during the week and when Saturday night comes it’s time to let their hair down – but I believe the underlying cause for this behavior is the restlessness that’s described in the Celestine Prophecy’s First Insight. Drugs are taken as a substitute for peace. During their week, users may live in the world of the mind, unable to switch off, but through their experience of taking drugs they know there is another level of life possible where they can feel more love and harmony in their surroundings if they “just take a pill”. Addressing MDMA (aka Molly) and Ecstasy, in particular, users frequently report feeling “Loved up” and will often spend hours talking with their friends and even strangers at very deep levels when they’re high. The introduction of MDMA into their bloodstream, often allows users open up to others on heightened levels, and the side effect of wanting to hug your friends and tell them you love them is incredibly common. Feeling an increased sense of love and happiness (just for maybe one night out the week) is no doubt a reason MDMA/ Ecstasy users will ignore health warnings and the dangers surrounding the unknown ingredients of what they ingest. There are drugs out there to suit a multitude of mindsets and whether users are looking to dance the night away or wind down and chill out, there is one thing all recreational users have in common – they want to change their vibrational energy level and they don’t know how else to do it.